Selling solar is a two-step process: get the customer to consider solar (lead generation), and then get the customer to buy (sales conversion). As most industry professionals know all too well, a lot of people take the first step but never make it to the second. A U.S. Department of Energy program called Solar Energy Evolution and Diffusion Studies (SEEDS) seeks to understand why people make the “switch,” and how to bridge the gap between thinking about and actually going solar. The National Renewable Energy Laboratory, Spruce Finance and others undertook a SEEDS project that looked at the differences between “considerers” (those who have spoken with installers about solar but haven’t invested) and “adopters” (those who actually made the switch to solar): Are the groups demographically different? Do they approach the buying process differently? And most importantly, what does it take to get considerers to become adopters? We surveyed a total of 3,592 people (1,662 adopters, 589 considerers, and 1,341 homeowners from the general population who hadn’t spoken to any solar installers) in California, Arizona, New York and New Jersey. We excluded people who wouldn’t normally qualify for rooftop solar, such as renters. 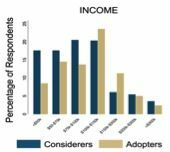 We then dove deeper into the adopter population to determine what influenced their satisfaction and willingness to recommend solar to other considerers (we’ll cover this in a second article). This study also leveraged findings from previous research on solar adoption, as well as literature on consumer marketing and diffusion of innovations. Our data suggests that getting customers to consider solar is opportunistic (e.g., installer approaches customers) or event-driven (e.g., sticker shock on bills or moving to a new house). Economics was the biggest overall driver of interest in and adoption of solar. But others factors are at play, which suggest that sales conversion is a layered process that depends on customers’ familiarity with solar. Those less familiar with solar tend to have more basic concerns about the suitability of solar for their house, the dependability of photovoltaics, and the accuracy of information about solar (Fig. 1). Those who are considering solar are more likely to know of others with solar and perceive personal benefits; unsurprisingly, they have second-order concerns, such as finding trustworthy or competent installers. Installers will need to address these concerns sequentially, as the customers become more engaged with solar. For instance, it probably makes little sense to discuss solar financing options with a customer who doesn’t know whether her roof is even suitable for solar. A separate study suggests that it’s better to focus on the one benefit that best meets the customer’s needs rather than provide a list of benefits, some of which may not be particularly relevant to the customer. For most installers (and most businesses) more competition is a bad thing; it drives down prices and siphons away potential sales. However, competition can be helpful when a product is new and poorly understood by the general population -- as is largely the case with rooftop solar. More companies installing rooftop solar will increase customer exposure to solar, which in turn increases the likelihood of considering solar as an option (Fig. 2). For instance, in California, which arguably has the most competitive rooftop solar market, survey respondents reported high familiarity with solar, perceptions of strong social support, and high levels of assurance of rooftop solar’s suitability for their homes. In other words, more competition will likely lower barriers to step one of the solar adoption process. It may, however, increase barriers to step two (converting leads into sales). That being said, solar companies are far more likely to lose considerers to uncertainty and doubt than to other competitors. There are nearly 10 times as many considerers as there are adopters. But only 11 percent of considerers have stopped shopping for solar altogether. The rest are either still considering it or have decided they want solar but have yet to sign. That means 84 percent of considerers are potential customers. This is significant: on average, out of 100 considerers, a solar company can expect to get between one and three adopters. If installers can capture even a portion of the remaining 84 percent of potential considerers, they could significantly increase sales. We found that considerers and adopters are demographically similar. They have comparable education levels, financial circumstances and political stances. In fact, liberals and conservatives seem equally likely to consider and adopt solar, though they do so with different motivations. For example, 85 percent of liberal considerers stated reducing their environmental impact was a very or extremely important motivation for them when considering solar -- only 56 percent of conservatives reported the same level of importance. In contrast, 83 percent of conservative considerers said that protecting their families from rising electricity prices was an important motivation, as compared to 76 percent of liberals. One thing was clear -- saving money on energy bills is a bipartisan issue (92 percent of conservatives, 87 percent of liberals). In general, people’s motives and concerns in thinking about solar are similar, with finances and savings at the top of the list. Economic motives and concerns appear to span all demographics and political beliefs. While considering solar panels, how important were each of the following factors for you? While considering solar, how concerned were you about the following? Unsurprisingly, considerers face more difficulties in the solar sales process than adopters, including getting everyone in the household to agree, finding a competent installer, and permitting and zoning restrictions. While considering solar, how much difficulty did you have with the following? Economic factors, including the desire for better financial outcomes and the ability to afford rooftop solar, seem to be the biggest difference between those merely considering solar and those who have made the switch. We don’t know whether considerers faced more job insecurity, had more existing debt, or had lower credit scores that disqualified them from solar financing (these were not questions included in our study), but we did find that considerers are more concerned about debt, with 57 percent reporting that they are “somewhat to extremely concerned” about taking on debt or signing a lease, versus 31 percent of adopters with the same apprehensions. The findings are consistent with prevailing theories on how new technologies spread. Prior research has shown that earliest adopters of innovations are more comfortable with unproven technologies and often see themselves as trendsetters. Later adopters are driven by a stronger sense of practicality; they would prefer to wait and see whether a technology works as promised and provides lasting benefits before investing in it. Though both considerers and adopters reported non-economic motivations (which is to be expected, since solar is still at the beginning of its adoption curve), considerers reported more practical -- that is, monetary -- challenges and considerations in making the switch. As rooftop solar spreads, the industry will increasingly encounter customers who will want more certainty about the benefits of solar relative to perceived total costs, which include the risks of things going wrong. Avoid the 7 common sales and marketing mistakes. Don't give up on old leads. Just because they didn't go solar doesn't mean they're not interested. It's more likely that the time is not right (for instance, they can’t afford it this year), or they wanted to shop around some more. With the cost of solar going down every year, prices will eventually reach many considerers' comfort level. And as considerers see more people going solar, that social validation can help convince them to make the switch. Periodically check in with early considerers (not too frequently, or they might feel hounded) to see if they’re ready to adopt. Keep track of your leads by using a customer relationship management (CRM) application or database. Most installers interviewed, including larger companies, did not systematically track old leads, or couldn’t readily retrieve information on them. A CRM application can help you prioritize old leads and set automatic reminders for periodic follow-up calls. Understand your customer’s needs. 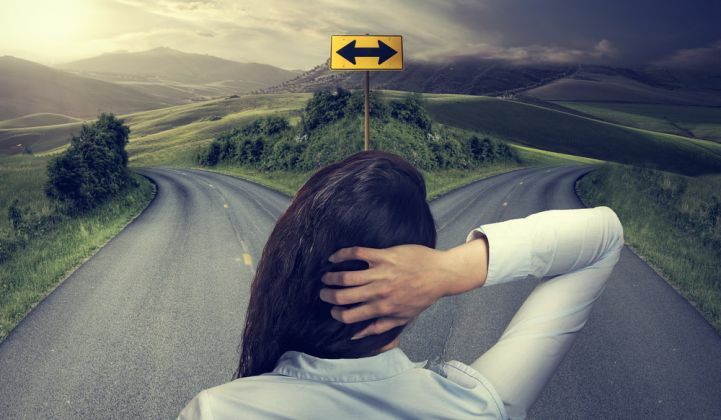 Take time to find out early in the sales process whether the considerer prefers to have control over the system or to leave the maintenance and monitoring up to you. If you recommend a product that meets the considerer’s preferences, you’re more likely to close the sale than if you try to sell a loan to someone who might prefer a PPA (or vice versa). Get independent verification. 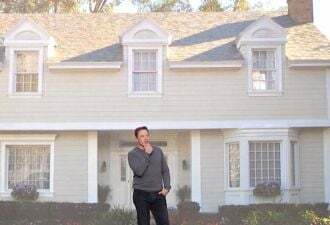 You can’t try before you buy with solar, which often makes people nervous. Existing misperceptions about the cost and savings of solar, compounded by confusing, contradictory, scary, or too-good-be-true claims make it difficult for considerers to identify understandable and credible sources of information. Thus, potential customers rely on verification of installers and contractors by credible independent sources. These can include: NABCEP certification; online reviews on sites like Google, Yelp and Facebook; references from past customers (see No. 9); or adoption of solar business codes like that of the national Solar Energy Industries Association (SEIA). Getting accredited, signing on to a business code, and monitoring and addressing your online reviews can go a long way to establishing your credibility. Evolve your sales tactics. It’s no longer always about the immediate close: as solar becomes an increasingly mass-market product and service, future solar customers will expect to be able to shop around and have time to consider their options. Quick or hard sells may have worked on adopters in the past, but future considerers will likely need more time to think or require more validation that what you are promising is legitimate. Providing educational information and advice and becoming a trusted resource while they shop around may be better than a “buy now, before it's too late!” tactic. Find new points of differentiation among your competition. As the residential solar market matures, it will become more commoditized. Future solar adopters will be more price-sensitive and less forgiving than early ones. Standing out in a crowded field will be more difficult (that’s already the case in saturated markets like California). You can protect yourself against cutthroat competition by differentiating your business in other ways than just price. For instance, you might: build your reputation in specialized markets (e.g., installations in certain locales or for certain types of customers or homes or roofs); obtain independent validation (see No. 5); grow a base of satisfied customers (see No. 9); or provide value-added services or additional technologies (e.g. storage, HVAC, smart thermostats, etc). Grow your business for the long term. A race for a bigger piece of the residential solar market can be very costly. Overly aggressive growth plans can incur fixed business costs (e.g., larger warehouses, more installation trucks, greater administrative overhead, etc.) too rapidly, which then forces you to rush sales or pay more for customer acquisition. Moreover, later solar adopters will be more likely to shop around and more resistant to high-pressure sales tactics; a rushed sale will likely lead to higher dissatisfaction, fewer referrals, and perhaps more negative reviews -- all of which can materially impact your business. At less than 1 percent penetration in almost every state, the residential solar market offers plenty of opportunities. You may be better off, especially if you’re small and have less working capital, focusing on growing profitably, rather than growing fast. Make sure your existing customers are happy. Referrals are still by far the most cost-effective way to acquire customers and may remain so as customers become even more resistant to traditional sales and marketing approaches. To get referrals, you need satisfied customers, who will also be more likely to provide positive reviews online and serve as references. (Conversely, a dissatisfied customer can prevent you from making new sales.) Don’t just forget about old customers -- it may be worth checking in with them on occasion to confirm things are working and that they’re happy. You can use that opportunity to ask for referrals or online reviews. The solar industry in general needs to do its part to ensure adopters are happy by promoting consumer protection standards and educational materials -- and holding bad actors accountable. The good news is that solar customers seem to be overwhelmingly satisfied with their experience and with solar. In Part Two, we will examine what drives that satisfaction. The authors are James Tong (CEO, Advanced Grid Consulting) and Alison Mickey (Sr. Dir. Corporate Comms, Spruce). Project contributors included: Lawrence Berkeley National Lab, National Renewable Energy Lab, Portland State University, Social and Environmental Research Institute, Spruce Finance, University of Arizona, and University of Michigan.